Honestly, I thought this had ended a long time ago and that he was already serving his sentence. 10 years of probation is a long time- if he ever gets pulled over for speeding, or if someone throws a punch or if he is in a home where they have guns...that could result in him being sent to prison for the entire term! 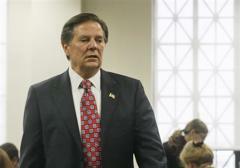 AUSTIN, Texas (AP) -- A judge ordered former U.S. House Majority Leader Tom DeLay to serve three years in prison Monday for his role in a scheme to illegally funnel corporate money to Texas candidates in 2002.